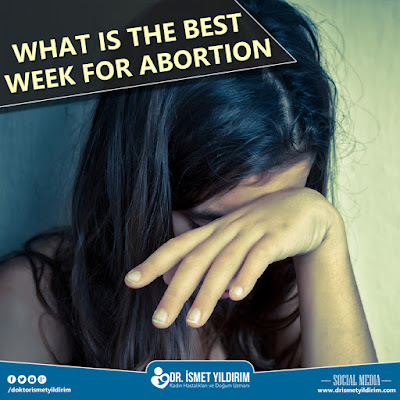 Health Zone Turkey: What is the Best Week for Abortion? The most appropriate week for abortion is the short term between 6 and 10 weeks of gestation, generally accepted. Because, in the short term mentioned above, in the mother's womb, the present embryo becomes large enough to be taken off. In pregnancy, if there is an abortion before 6th week, there may be some medical problems. For this reason, it is very important for the physician to evaluate with regular examination. When your pregnancy is smaller than 6 weeks, it means that the embryo, which is in the mother's womb, has not reached the size yet to be fully taken, that is, it has not grown. As a method of abortion operation, either vacuum method or sharp curettage method is preferred, unfortunately there is a possibility that the part remains behind the woman's uterine wall or that the pregnancy cut-off can not be completely cleared. Such cases can then create vital, too risky situations for women, leading to severe problems such as very severe pain in women, bleeding in excess, blood collection in the uterus, risk of infection, or perforation of the uterine wall. Because of these reasons, the present pregnancy is at least 6 weeks long and it is very important to terminate the abortion operation in a healthy way. There are also some important situations in the way of possible complications during the abortion operation. First of all, it is important that the mother candidate whether has never given birth before. It is also important how many times the mother has given birth and how many times she has an abortion. This information should be clearly stated to the doctor. Because the number of births enhances the possibility the rate of complications that will emerge increases accordingly. Moreover, as the mother of the abortion candidate grows older, the likelihood of complications also increases. Compelling situations in the body, hormonal troubles can make the woman's condition even more difficult. As the gestational week progresses further, the potential risks increase. For this reason, it should be acted immediately for the abortion procedure before it is too late. With each passing day, the risk of possible complications is also increasing. The health of the patient is important, and the information to give to the doctor is also important. The fact that your pregnancy is not bigger than 10 weeks is also a necessary point for the legal procedure. The exact legal time for an abortion operation in our country is the end of the 10th week of pregnancy. It is forbidden in our country to terminate a pregnancy with an abortion operation after the 10th week of pregnancy, and the criminal procedure is carried out seriously to the institution that performs the abortion process, to the patient and the doctor perform the operation in this sensitive subject. In addition to this criminal procedure, of course, this process carries great life risk, primarily for the health of the mother. However, if a delegation report confirms that the present pregnancy is a life-threatening risk for the mother, or if the baby is growing up in the womb, then the abortion can be done after the 10th week. However, the delegation report and family approval is absolutely essential. The person who will decide again in the best week for abortion is of course your doctor. Your doctor will make a pre-requisite for examination and examination meetings and you must submit your request for a preliminary abortion procedure yourself and this should be taken with your doctor. The condition and placement of the embryo in the vaginal examination to be done with ultrasonografic will be determined clearly and the gestation week will be precise with precise measurements. The best time for an abortion operation will be determined by your doctor in this way. The purpose of your doctor is to convey the importance of taking precautions. All of this information is of great importance to you in your own health and certainly should be followed in all the letters. You will plan to live later, please take care of yourself for pregnancy. Do not forget that abortion is a surgical intervention, even if it is small-scale.